In a collaboration between the National Women’s Hockey League (NWHL) and Russian Ice Hockey Federation, the Russian National Team (RNT) will come to the United States this October for two weeks of training and competition. 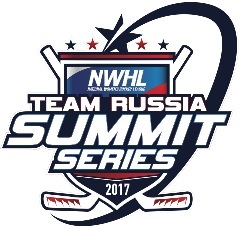 The “NWHL/Team Russia Summit Series” will feature the RNT playing two preseason games each against the Boston Pride, Connecticut Whale and New York Riveters. Team Russia will also participate in training sessions during the trip. The two-week visit from Oct. 11-23 will serve as training for Team Russia as it prepares for the 2018 Winter Olympics, and as preparation for the three NWHL clubs before the league’s regular season begins in late October. The RNT faced NWHL clubs in five preseason games in 2016. Dates, times and venues for the games will be announced this summer. The 2017-18 NWHL regular season is set to begin in October, featuring founding four franchises Boston Pride, Buffalo Beauts, Connecticut Whale and New York Riveters playing a full slate of home games as well as neutral site games.